Montreal’s Dunn’s Famous opened their doors with a red carpet welcome to media and industry last Tuesday night (Nov 15). Their Vancouver location marks the first of their eight locations to open outside of Quebec [Ed. note: we have since been corrected in this regard. There are actually three, other Dunn’s outside of Quebec, in Ottawa, although they are not listed on the Dunn’s Famous Deli website]. 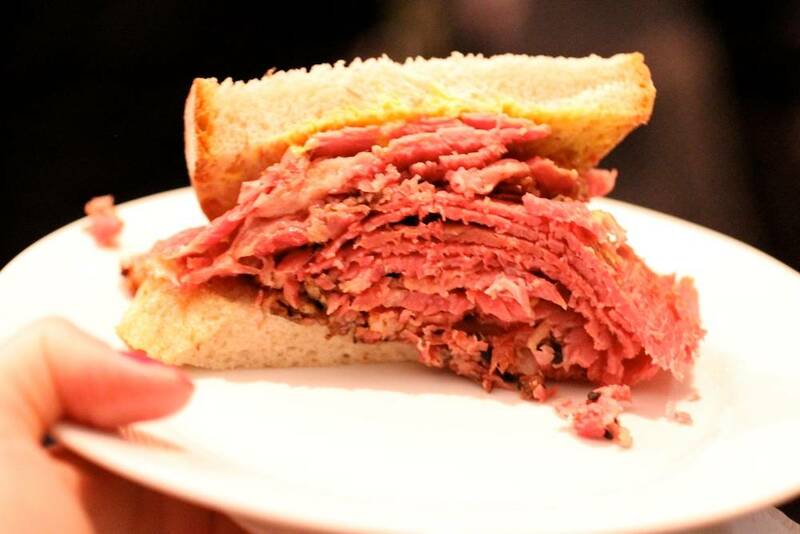 For smoked meat aficionados and ex-Montrealers, this was a momentous occasion. To put it in terms that a Vancouverite might understand, having Dunn’s open in Vancouver is – in familiarity if not quality – like having White Spot open in Montreal. Needless to say, Dunn’s Famous is an institution, and has been serving diner favourites and comfort food to hungry Montrealers since 1927. But mention the name Dunn’s to almost anyone and the first thing they’ll think of is smoked meat. For the uninitiated, smoked meat is smoked beet brisket and has more in common with New York pastrami than southern beef BBQ. 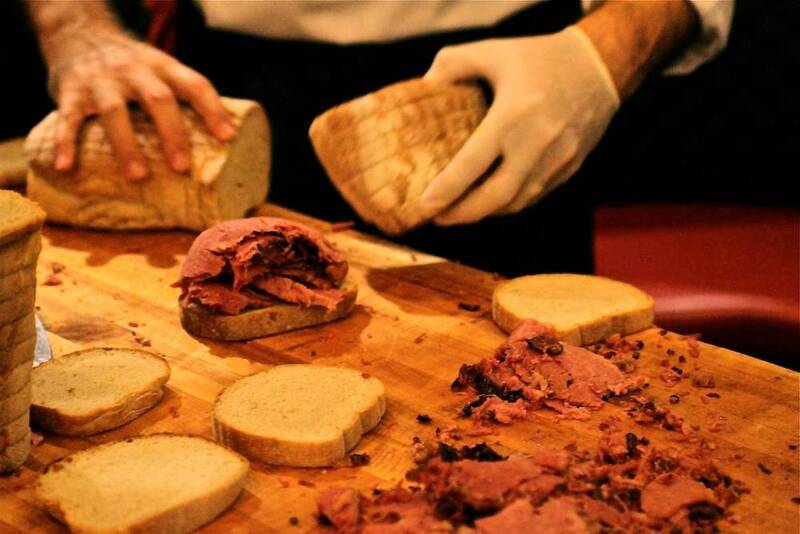 If there was any question whether Vancouverites have an appetite for Montreal smoked meat, the never-ending snaking line-up for it on Tuesday night soon put doubts to rest. Sure, Vancouver has seen several attempts (Siegels, PHAT Deli) at serving the coveted Montreal smoked meat sandwich, but Dunn’s brings a Quebecois authenticity by hand-carving the brisket to order and sticking to the classic sandwich recipe: take two slices of untoasted rye bread, smother with regular mustard, stack high with hand-carved smoked meat brisket and serve with a sour pickle. “How would you like your sandwich?” Chef Adnan Mizra asked me as I approached the front of the line. Lean, medium-fat, or fatty are the unspoken choices, and knowing that you’re not supposed to order lean if you were in the know, I told him “whatever you recommend.” He then swiftly yet meticulously carved fatty pieces of brisket from the hunk of meat and then shaved some of the seasoned lean rind. Balancing the meat on his knife, he piled what seemed like 5 inches of beef on my tiny slices of mustard-smothered bread. As I watched the meat cascade over the sides of my bread, I knew I had discovered my new lunch joint. I was in la la land and my first bite confirmed it. At Dunn’s, they spice and smoke the meat for 17 days and then steam it for 3 hours before it’s served. As a result, the meat isn’t chewy, stringy, or even greasy; it’s juicy, moist and flavourful – buttery soft to bite into like a fine foie gras. 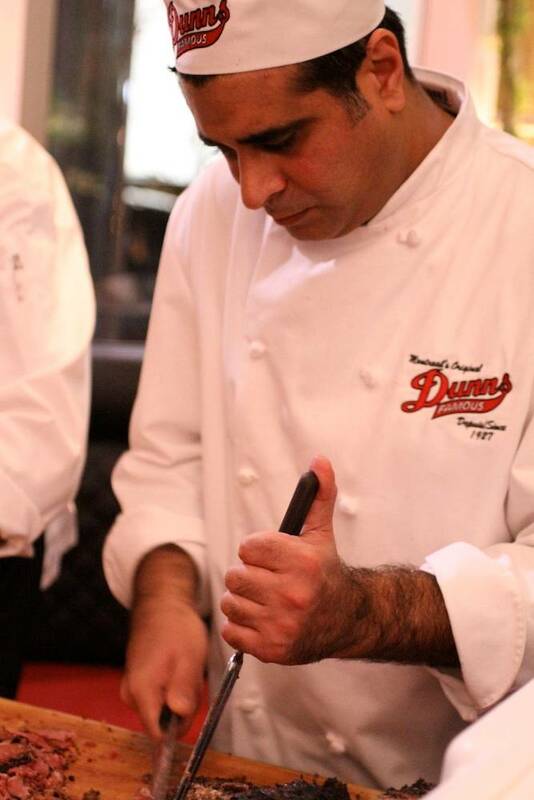 While Chef Mizra had flown in from Montreal to train staff and showcase his talents, those in attendance were able to sample other menu items that don’t always get the same attention. Some of these items included the classic beef sliders – juicy little morsels complete with fresh tomato, lettuce and sautéed onions; reuben sandwiches made with chicken and smoked meat, served on a sesame seed hoagie; and poutine made with bona fide cheese curds and that special hard-to-describe poutine gravy, available in a vegetarian version if desired. Russell Brewing provided the beer and Desert Hills poured the wine, but I was curious about Dunn’s cocktails. 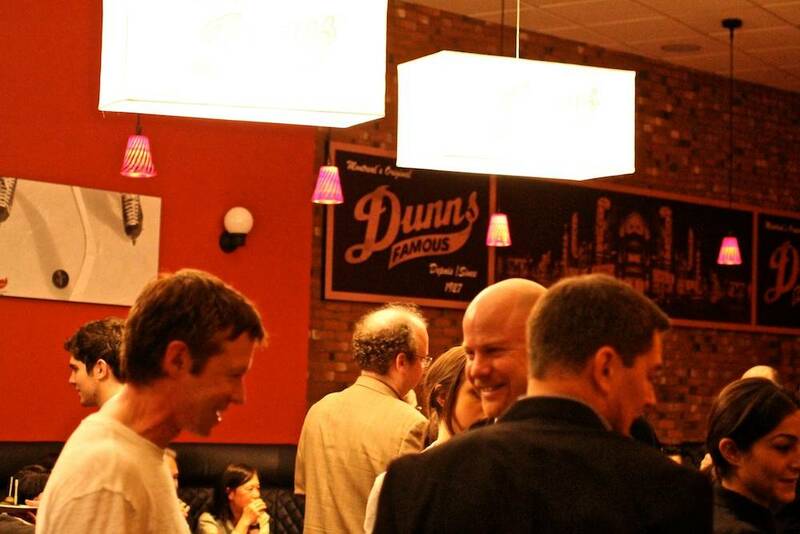 The Dunn’s Caesar was the perfect starter. Made with Absolut vodka, Clamato juice, pickle-juice and rimmed with Montreal steak spice, it was a nice take on the classic and very easy to drink. 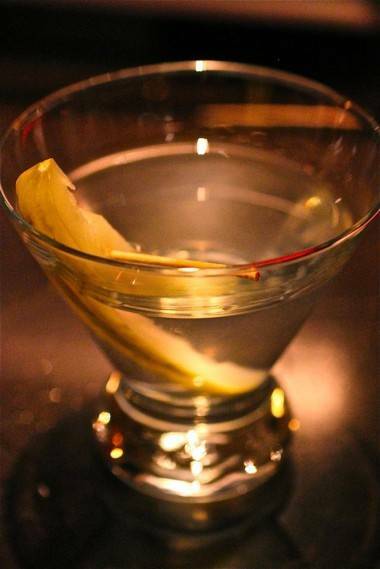 The Dirty Pickle Martini, made with Stolichnaya vodka, a touch of vermouth, and pickle juice, is garnished- or rather, accentuated – with a Dunn’s Famous pickle. If you’re looking for a dry, stiff drink, this’ll do the trick. Later in the evening, sipping my wine with a this slice of chocolate ganache cake from a desert table in the back room of the newly opened restaurant, I reflected on experiencing a Montreal institution in Vancouver. Here, it’s a modern take on a traditional smoked meat deli – part casse-croûte*, part sports bar. The interior décor is classy – exposed brick walls, red paint and black leather banquettes – with scenes of Montreal and obligatory hockey motifs as art. This is not at all like the old (now defunct) original location of Dunn’s in Montreal on Rue Ste Catherine – that locale had the ambiance of 1940’s cafeteria. Even with an updated image, though, Dunn’s will always evoke nostalgia for the Montreal of yesteryear, at least for those who have experienced it. The rest of us can get to know this perennial favourite in new surroundings. *Casse-croûtes are snack shacks in Quebec famous for poutine and steamed hot dogs “steamies”; a quintessential part of Quebecois street food culture. 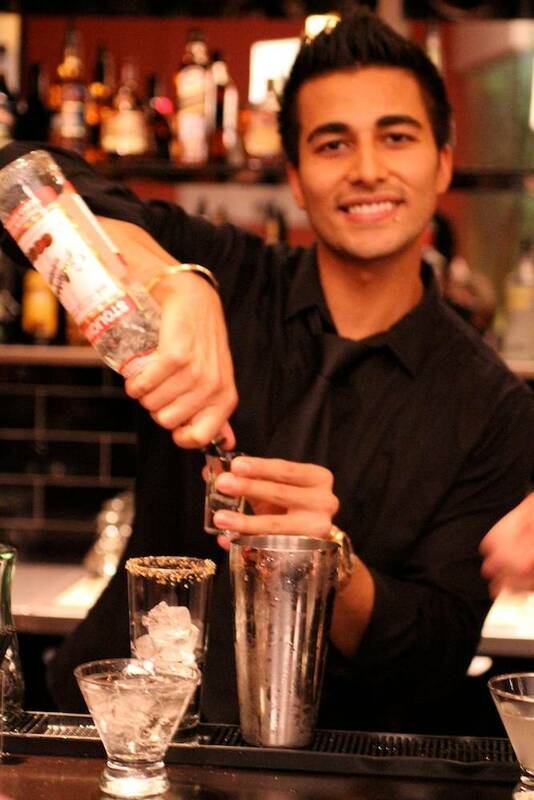 This entry was posted in dining and drinking, Features, the latest and tagged restaurants, Vancouver. Bookmark the permalink. So it’s like having a chain of generic, not even middle of the road food serving restaurants open up…but with french people? Well, not exactly! But for a lot of Vancouverites WS is a reminder of home, just like Dunn’s for Montrealers. What I was trying to convey was that both White Spot and Dunn’s have thrived in their respective cities since the late 1920’s and have become institutions, for better or for worse. While (some) Vancouverites wax nostalgic for Triple O Burgers at White Spot, Montrealers share a similar sentiment for Dunn’s. Dunn’s isn’t gourmet, I admit, but their smoked meat knocks the socks off what had been passed as authentic Montreal-style smoked meat in Vancouver previously. It’s worth the visit. I hate to disappoint you but Dunn’s has had two restaurants outside of Quebec in Ottawa, Ontario, for years. Not disappointed, but grateful for the correction. Thanks!